A recent comprehensive review of cancer therapies that included treatments for peritoneal mesothelioma found that combining CT and PET scans may allow doctors to better predict post-surgical survival rates and determine which patients will benefit most from invasive procedures such as the multimodal approach of cyto-reductive surgery (CS) and hyperthermic Intra-Peritoneal Chemotherapy (HIPEC). In short, cyto-reductive surgery is simply a surgical procedure to either remove or reduce the size of cancerous tissue. Hyperthermic intra-peritoneal chemotherapy is a procedure in which heated chemotherapy drugs are administered directly to the diseased areas of the patient’s body rather than through an IV drip. Data collected from a variety of cancer cases ranging from peritoneal mesothelioma to colorectal cancer was examined by Antonio Sommariva, Pierluigi Pilati, and Carlo Riccardo Rossi, researchers at the Melanoma and Sarcoma Unit of the Veneto Institute of Oncology and the Department of Oncological and Surgical Sciences at the University of Padova in Italy. They discovered that patients who underwent cyto-reductive surgery and intra-peritoneal chemotherapy were better served by having been properly categorized before any mesothelioma treatment had even begun. In fact, the study recommended that “stringent patient selection should be directed to exclude ineligible patients, such as those with extra-abdominal disease or ‘site specific’ un-resectable abdominal disease, and to quantitate the extent of peritoneal carcinomatosis.” In other words, patients should be thoroughly examined and placed on a sliding scale before treatment options are weighed. The review goes on to state that “Computed Tomography (CT) represents the preferred and most used diagnostic tool for selecting patients eligible for CS + HIPEC.” However, they also recommend PET scans and laparoscopy in order to accurately determine the overall scope of the cancer. This gives doctors a reference point which they can use to roughly predict the patient’s post-surgical survival rate and the effectiveness of the procedure itself. By combining these three pre-surgical procedures, the oncologists can then place the mesothelioma patient on a scoring continuum called the Peritoneal Cancer Index. 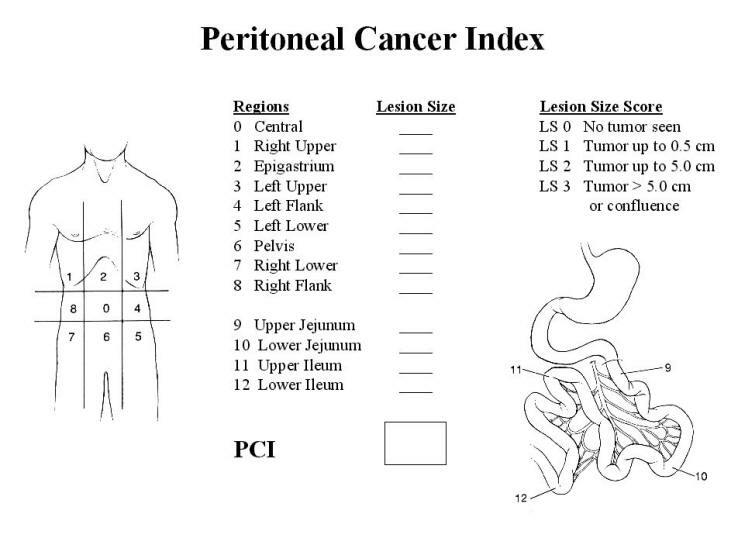 The index really measures two things: the size and the location of nodules within the peritoneum. This is extremely important and, when combined with the patient’s comprehensive medical history, may rule them out as a candidate for cyto-reductive surgery and hyperthermic intra-peritoneal chemotherapy. However, the review also noted that in some cases, patients who are currently ineligible for this multimodal mesothelioma treatment may become viable candidates after undergoing systematic chemotherapy. Systemic chemotherapy introduces drugs that combat asbestos cancer intravenously (through an IV). Another interesting finding in the report is that cancer patients who underwent this multimodal treatment for mesothelioma, specifically diffuse malignant peritoneal mesothelioma (DMPM), were, on average, likely to live up to 53 months with 47% living as long as five years. That is compared to a “normal” lifespan of just 12.5 months for peritoneal mesothelioma patients who were not given this treatment option. The study closed with the researchers stating that while this cancer treatment is still considered experimental, continuing advances in medical imaging and the increased skill level of radiologists only adds to the success rate.